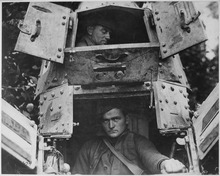 In a sense the idea of armored vehicles goes all the way back to antiquity, when siege equipment was equipped with wheels to roll it up to the enemy walls and “armor” to protect the machine and its crew, but the serious development of armored vehicles had to wait until the internal combustion engine. 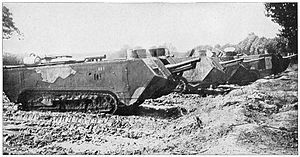 Armored cars were soon developed, but possessing very light armor and wheels, they were unsuitable for the conditions of trench warfare, which demanded a tracked vehicle. 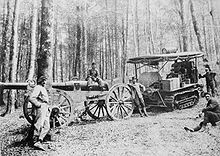 In the early days of the Great War tractors were in fact used to tow artillery pieces and supplies, and it was a short conceptual leap to arming the tractor itself. A short conceptual leap, but one that had to confront the innate conservatism of the military establishment, which was already having problems accepting the obsolescence of cavalry. 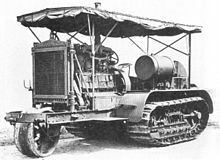 An official British war correspondent in France in 1914, Major Ernest Swinton, realized that the American Holt caterpillar tractor could serve as the basis of an armored vehicle, and sent a proposal to Lieutenant-Colonel Maurice Hankey, who brought the idea to Kitchener, who, however, showed no interest. 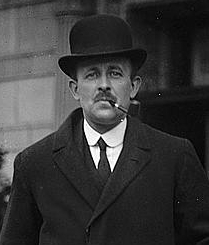 Hankey then went to the Committee of Imperial Defense and caught the attention of the First Lord of the Admiralty, Winston Churchill, who in January 1915 scared Prime Minister Asquith into examining the idea by suggesting that the Germans could be developing their own armored vehicle. 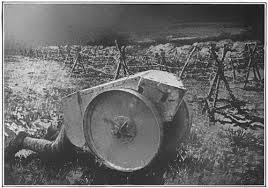 Kitchener was ordered to create an Army committee to study the idea, but after trials with a Holt tractor the committee decided in February the concept was not workable. Churchill, however, was determined and created a Navy operation, the Landships Committee, which began working with the Royal Naval Air Service, which had an Armored Car Division. Incidentally, in order to disguise the nature of the project it was spread about that the committee was designing mobile water tanks for desert combat, which led to the name Water Container Committee, which was quickly discarded, because it would soon enough be shortened to the WC Committee. In December the term “water tank” was adopted, and you know the rest. It was decided that simply transforming Holt tractors into tanks would not work – the suspensions and power plants were too weak – and the committee would design the new machine from the ground up. Using giant wheels instead of tracks was rejected, as were designs employing a single large or three separate tracks, and the obvious idea of a rotating turret with a gun was abandoned because of weight and center of gravity concerns. Before anything else, better track systems had to be developed, which was the purpose of the first prototype, tested on 8 September. 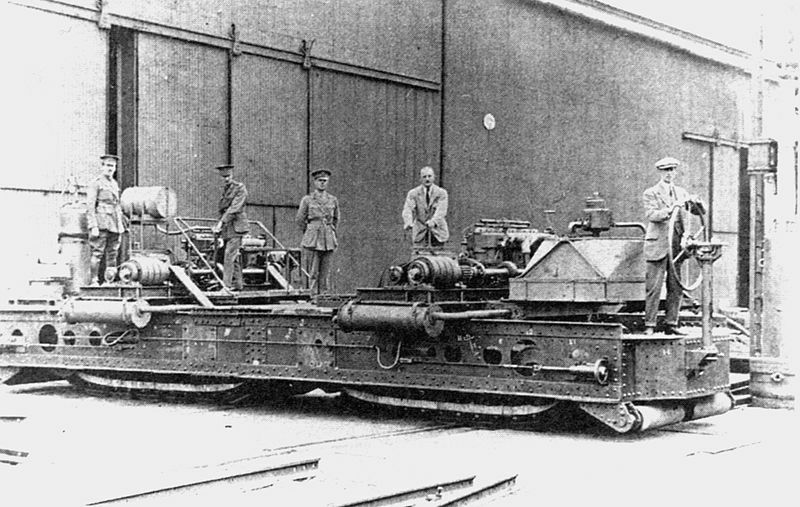 Little Willie (named after the German Crown Prince) was simply a metal box on tracks, 20 feet long, weighing in at 16 tons and powered by a 105 hp engine. 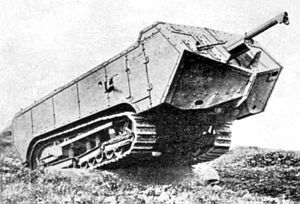 This led in early 1916 to the 28 ton Big Willy (or Mother), which had a 25 foot long rhomboidal body and surrounding tracks, providing better traction and ability to cross an eight foot trench. The “male” version had two 6-pounders mounted in sponsons on either side of the hull and carried a crew of eight; the “female” had only machine guns. At best they could make four miles an hour with its 105 hp engine. These were definitely not Blitzkrieg machines. 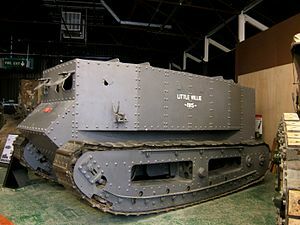 Big Willy became the Mark I, of which 150 were produced, and it saw its first service in September 1916 in the Somme Offensive, where both the potential and the many deficiencies of the machine were demonstrated. The armor could stop ordinary small arms fire, but was vulnerable to armor piercing rounds developed by the Germans and could be disabled by even the smallest artillery round. Besides the slow speed, often as a little as one mile an hour on the lunar terrain of no man’s land, the tank was difficult to maneuver, requiring half the crew to attend to the steering and drive. 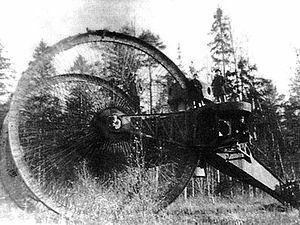 These early machines were also dramatically underpowered, but by far the biggest problem was mechanical, simple breakdowns that left the tank little more than a target. 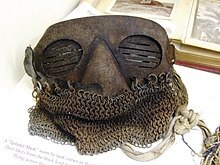 Life for a tank crew was hellish. Ventilation was extremely poor, and with the engine in the crew compartment carbon monoxide could reach deadly levels and was supplemented by fumes from the cordite in the shells fired. 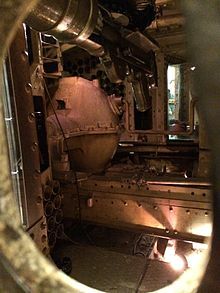 The temperature inside the tank might go as high as 120° F, and the crew was forced to wear helmets and special “splatter” masks to protect them from fragments dislodged in the interior by bullets and nearby shell blasts. 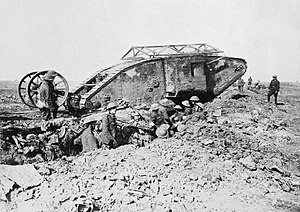 Nevertheless, for all the problems with this infant technology the tank demonstrated its usefulness, and even Haig, a cavalry officer, was won over and ordered more machines after the Somme. Development of the Mark I continued, all the way to the Mark VIII, and though the external appearance changed very little, improvements in armor, steering and power plant gradually came about, albeit very slowly. 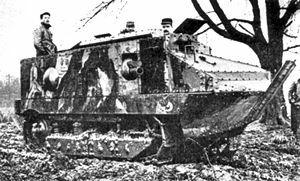 The Mark IV, which was used at Cambrai, was not very different from the Mark I: it had thicker armor and the fuel tank was moved outside to the rear of the tank. The Mark VIII (“Liberty”), a joint American-British-French project, featured a 300 hp engine in an enclosed compartment and much better steering and power transmission, but it only went into production after the war. The French approach differed from the British in that there was no central development authority, resulting in three different designs produced by rival industrial firms. 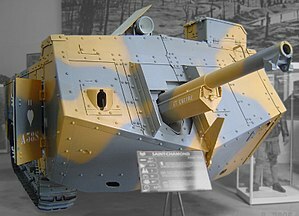 In early 1915 arms manufacturer Schneider began work on the Schneider CA, an armored box on tracks, mounting a 75 mm short howitzer in a barbette on the right front corner of the box. 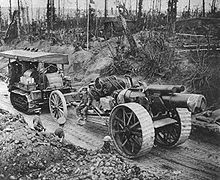 It first saw service in April 1917 in the Nivelle Offensive, where its poor mobility and great mechanical unreliability was vividly demonstrated. Another arms company, Saint-Chamond, used its political influence in 1915 to acquire support for its Saint-Chamond tank, which first saw action in 1917. 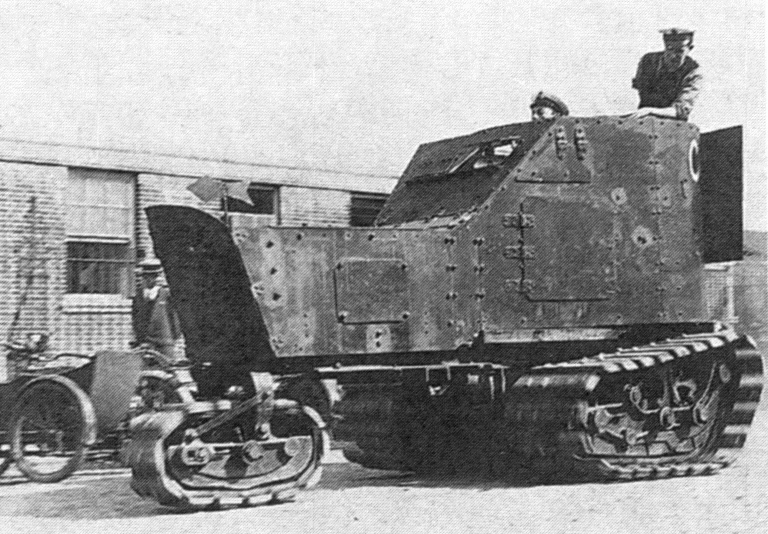 The Saint-Chamond carried a full size 75 mm gun (the most powerful for an operational tank until 1941) protruding from the front of the vehicle and an advanced petrol-electric transmission. But the tank had all the faults of the Schneider, and the new transmission system led to many breakdowns. Nevertheless, by the middle of 1918 the Saint-Chamond had found a role as an assault gun. France’s third tank was by far the most successful. 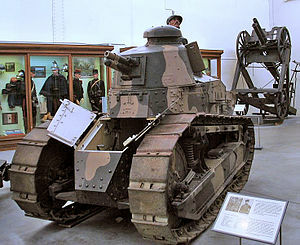 Renault, accustomed to mass production of cars, came up with a design for a light tank, the 7 ton Renault FT, which entered service in late 1917. This was in effect the first modern tank: the power plant was at the rear, and a fully rotating turret on top housed the armament, either a 37 mm gun or several machine guns. 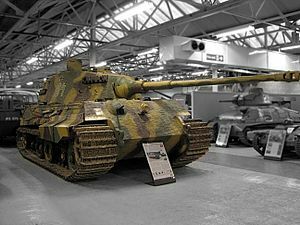 The design was very successful, and 3700 were produced – more than any other tank in the war – many finding employment in various countries until well after the Second World War. 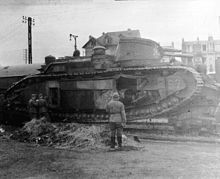 The French army, however, still wanted a heavy tank, and the 76 ton, 33 foot long 2C was created, the heaviest and most advanced tank yet. It was, in fact, so technologically complex that only ten were produced and missed the war altogether. But the 2C remains the heaviest operational tank ever made. Oddly, the Germans showed little interest in tanks and responded to the Allied vehicles by concentrating on anti-tank weapons. 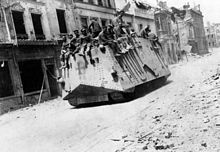 They produced only one tank, the 36 ton A7V, which sported a 57 mm gun at the nose and had a crew of at least 18. 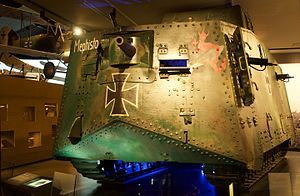 The A7V came into service in March 1918, but only 20 were built and most of the tanks used by the Germans were captured British Mark IVs. They would do better in the next war. 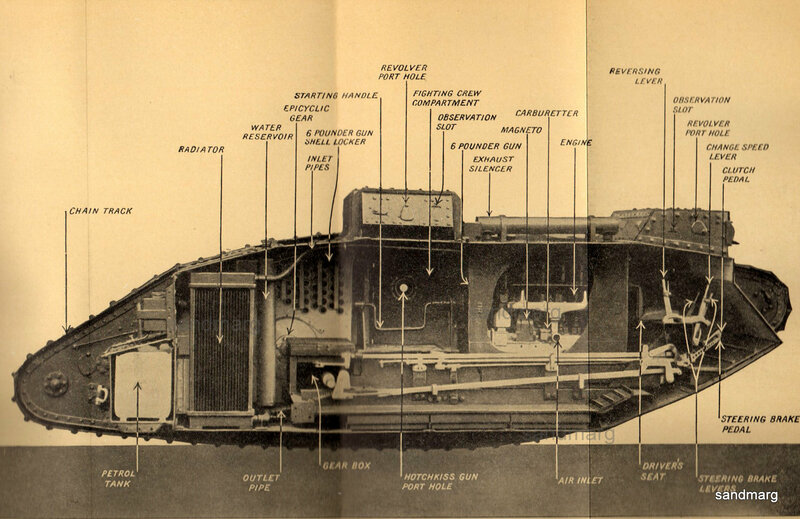 The development of armored vehicles was in response to the demands of static trench warfare, but the tank would become the prime weapon of modern wars of movement. Tanks would not only exploit a breakthrough, as cavalry was expected to do in the Great War, but also create the breakthrough itself with powerful concentrations of mobile firepower. Ironically, it was the Germans, uninterested in the tank in the First World War, who would perfect the tactics and strategy of armored warfare in the Second. 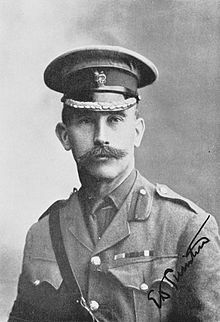 This entry was posted in armored vehicles, Britain, Ernest Swinton, France, Germany, Great War, Landships Committee, Little Willie, Maurice Hankey, tank, tractor, war, Western Front, Winston Churchill, World War I.